It was probably cheaper for Crytek to open a new studio & hire the old Vigil team than to actually buy Vigil. Just a guess. Glad to hear fewer people are unemployed, but I am worried about the Darksiders franchise. I want my 4-player co-op with all 4 horsemen! So it's always interesting that after the dust begins to settle, the curtain gets peeled back a little bit to reveal some of what happened. On one hand Jason Rubin, the final president of now-defunct THQ, isn't making excuses for the publisher's failure. Asked by MCV if the industry pains squeezing out mid-tier publishers are what sank the company, Rubin said no, THQ created a lot of its own problems. It may sound self-serving but Rubin is totally right. Danny Bilson was in charge when THQ was throwing good money after bad on things like uDraw and kiddie titles, and when Bilson was fired in May, few tears were shed for him in his own company. The incredible losses attached to uDraw, massive wasted capital in the unpublished MMO that was cancelled, sticking with children's and casual titles far after mobile and tablets had killed the business, bad, late, or otherwise inferior titles like Homefront, and a generally haphazard and inefficient approach to deal making, left the company with too much negative hanging on its books. As for Homefront, Rubin wouldn't attribute its flop to bad luck or to an audience that just didn't warm up to the game. And Homefront was a Bilson favorite, too. MCV's postmortem on THQ goes into a lot more detail about the firm's demise and its sale, including the general surprise that neither Electronic Arts nor Warner Bros. showed up to bid on any of THQ's studios or assets. There's also an explanation for why Koch Media paid $22.3 million for Volition, Inc. and Saints Row when the backup bid by Ubisoft was only $5.4 million. But there's nothing about the fate of WWE, of course. Probably with publicly traded companies and contracts involved, no one is answering any questions about that deal—with $45 million left on it—until a new owner is found, which is rumored to be Take-Two Interactive, publisher of 2K Sports. Was THQ’s demise the result of bad management, bad circumstances or just plain bad luck? The company that had generated millions from games based on Finding Nemo and WWE, had struggled to transition into a world where kids games and licenced titles were no-longer safe bets. Certain analysts and industry commentators are already suggesting THQ never stood a chance. In an industry that’s enduring a painful transition away from the triple-A, boxed game model, mid-tier publishers are the ones that will ultimately get squeezed out. THQ is just the first big victim. Except, not everyone agrees with that view. Including THQ president Jason Rubin, who was parachuted into the company in March 2012 in a last ditch attempt to rescue the ailing publisher. “To be sure, all triple-A publishers have been under pressure, but THQ had every chance to survive had it not made massive mistakes. “Unfortunately, the mistakes that were made long before I joined, like the incredible losses attached to uDraw, massive wasted capital in the unpublished MMO that was cancelled, sticking with children's and casual titles far after mobile and tablets had killed the business, bad, late, or otherwise inferior titles like Homefront, and a generally haphazard and inefficient approach to deal making, left the company with too much negative hanging on its books. The CEO of Koch Media Dr. Klemens Kundratitz, who has just acquired THQ’s Saints Row and Metro IP, feels THQ’s demise may have been avoided if only one of its titles had broken through. “Each company needs to know where they stand and what they are capable of doing, and also what they are not capable of doing,” he tells MCV. “It is also quite important with projects of this size that THQ was dealing with, that these projects are being thought through from start to finish early on, and you don’t run into problems of discontinuing development or changing a game concept in the middle of the development. So was THQ just unlucky? Not according to Rubin. “I think that luck plays a role in success and failure, but THQ's decisions and execution were the major reason for its failure,” he argues. Rubin’s harsh assessment says that THQ’s failure was its own. But he, like the rest of THQ’s management, believed the company had a future. There was a string of promising products on the way, while established brands were being given more investment and time. In a bid to turnaround Homefront, THQ had given the title to proven and popular FPS studio, Crytek. So that’s why THQ filed for Chapter 11 Bankruptcy in December. The plan was to sell itself to investment firm Clearlake Capital, clear itself of its debts, and move forward with its new, slimed-down line-up. “I actually agree with a lot of the stuff Jason Rubin says in regards what went wrong at THQ,” says Crytek’s general manager for games Nick Button-Brown. Crytek ended up buying the rights to Homefront in the auction last week and will complete the sequel itself. Unfortunately for THQ, the creditors were not happy about the prospect of a quick, cheap sale. Clearlake was only offering $60m for the firm, and the creditors and the US Bankruptcy Court felt this was too low. So THQ and its various assets were put up for auction, if the company can be sold off for more piece-by-piece, then THQ would effectively be no more. "The auction was incredibly dull,” recalls Button-Brown. “We just didn't know what was going on. The most efficient way to do it was over Skype chat, so there was all of us sitting on Skype waiting for something to happen. It was an auction that took two days. It went so slowly. After the auction, THQ’s individual assets went for a $72m, significantly higher than the $60m offer, and the publisher was effectively finished. Yet what was most surprising was who turned up at the auction. Despite initial interest and visiting the Volition studio, both EA and Warner Bros did not take part. In fact, Ubisoft was the only major publisher involved, with small and mid-tier publishers collecting the assets – Koch Media, Crytek, Take-Two and Sega. “We were actually surprised about EA and Warner not showing,” says Kundratitz. “What was our advantage is that Sega came in with quite a substantial bid for Relic and Company of Heroes and Take-Two came in with a substantial bid for Evolve, so the total of the piecemeal bids came to a large amount, which made it quite difficult for Clearlake to compete against. Far from being a warning about the future of middle-tier publishing, THQ’s collapse has added to those publishers. Take-Two has another new IP to place alongside its impressive line-up. Sega’s niche PC titles have been given a real boost in the acquisition of Relic. Koch Media – which has only recently had its first big global hit in Dead Island – has arguably acquired its biggest brand. And in buying Homefront, Crytek is on its way to becoming a publisher in its own right. “It was a weird set of people in the auction, we were quite surprised by the some of the people that didn’t turn up,” continues Button-Brown. “It isn’t who we’d have picked out at the start. It’s interesting that the middle-tier publishers have come out with some interesting properties and interesting teams." Koch Media winning Saints Row and its developer Volition was a big surprise. Outside of its home turf in Germany, the firm isn’t well-known amongst gamers. 2011’s Dead Island has been by far its most successful title, although it has published a number of niche and territory-specific products around Europe. Volition and Saints Row was seen as the crown jewels in THQ’s crown. Ubisoft, EA and Warner Bros – three of the biggest names in entertainment – were amongst the names eyeing the company. Koch's only advantage was that it had worked with THQ over the last six months as its Italian and Spanish distributor. But Koch Media’s bid of £22.3m won through. In fact, it looked like the studio had overpaid, with Ubisoft only offering $5.175m. But Kundratitz explains that wasn’t the case. In fact Koch had been drawn into a bidding war. “The reports about Ubisoft’s bid and our bid and the big discrepancy is not entirely the true picture,” he says. Saints Row is a significant IP for Koch Media. But the studio is arguably the biggest gain, giving the publisher access to talent and technology it didn’t have before. “We have always been fans of Saints Row,” says Kundratitz. Koch Media found itself in hot water with the press last month following its controversial pre-order bonus for the next Dead Island, which included a mutilated female torso sculpture. The publisher regrets the bonus, but in many ways it shows that Koch – and its publishing label Deep Silver – could be well suited to Saints Row, which has itself attracted its own controversy. The other part of Koch Media’s bid saw it pick up Metro, a game that is already finished. “Metro has a gamer audience that we know quite well,” says Kundratiz. The rest of the bids were less surprising. Sega just about beat Bethesda to claim Relic for $26.6m. Relic is responsible for the Dawn of War and Company of Heroes (pictured) strategy titles, which ties in nicely with Sega’s Creative Assembly and Sports Interactive PC developers. In fact, Sega has recently acquired the Warhammer licence, while Relic had developed titles based on Warhammer 40,000. As a result, Sega is tipped to acquire the 40,000 licence, too. Miles Jacobson, the head of Relic’s new sister studio Sports Interactive, was delighted by Sega’s move. “Us and Creative Assembly work closely together, and we knowledge share and we tech share between the studios,” he says. “But it’s not forced upon us. Nobody tells me to use a Creative Assembly engine. But if Creative Assembly or ourselves wanted to use some of the code from the other studios, we know that it is there and that we can do. Meanwhile Ubisoft’s acquisition of THQ Montreal for $2.5m also made sense. Ubisoft already has a presence in the city, while it already knows many of the staff, including creative director Patrice Désilets. "We know Montreal well and we know a lot of the people there,” says Ubisoft’s director of IP development Tommy Francois. Ubisoft also made a bid for Volition, but Francois for one is pleased the firm only has to focus on integrating one new development outfit. "Acquiring a studio is much more difficult than it looks on paper. It's like a wedding. You need to know that other person. You need to meet halfway to create a third entity together: there's you, there's your wife and then there's you and your wife. To do that well is going to require a lot of time and effort from both Ubisoft and THQ Montreal, and you can't do that on so many different fronts. Whereas Ubisoft, Koch Media, Sega and Take-Two had splashed out big bucks for its new toys. Crytek spent a cool $500k for acquiring the rights to Homefront. Nick Button-Brown feels the studio has snapped up a bargain in acquiring the brand. But he says it wasn’t all about the brand name, rather it was about the game they had been building over the last two years. “It's much bigger than Call of Duty," he jokes. "It's a game that was commercially successful rather than critically successful. We did not buy it because it is a slam-dunk brand that everyone around the world knows and will get 10m sales on the name alone. We bought it because we put two years into development, we thought we had a really high quality game, and we liked the setting and the story, it's really quite cool. That world gives you so much flexibility. The things we are delivering in Homefront 2 are great. This IP we think gives us a chance to make a really interesting game. "The last milestone that we delivered in December just before THQ entered Chapter 11 was really good." Crytek has been vocal in the past about becoming a free-to-play developer. And that its remaining boxed products, including Ryse for Microsoft and Crysis 3, will be its last. Now that Homefront is owned internally, does that mean the next game in that series won’t be coming to retail? THQ’s publishing business was not sold, leaving 300 people unemployed. Nor was THQ’s old brands, like Red Faction and De Blob, although these were brands that even THQ had given up on. Meanwhile, licences like WWE have returned to their owners. 2K is rumoured to be in for the wrestling licence. But the biggest asset not acquired was Vigil and the Darksiders licence. The two Darksiders games have been critically well received, but although the first game was a small commercial success, its sequel (pictured below) underperformed. And as a result no-one came in. “We had a brief look at them, but we decided it was not our taste,” says Kundratitz. But it takes a developer to see the value in development talent. And although it didn’t acquire Vigil, Crytek did the next best thing and set up its own studio in Vigil’s hometown of Austin and picked up many of its staff. A deal that Jason Rubin. “They are a really good team, and we didn’t understand when no one picked them up,” says Button-Brown. THQ’s Rubin adds: “I am extremely pleased that Crytek saw the talent in the core team at Vigil. As I have said elsewhere, I consider it a failure on my part that I was not able to save the whole team. And that’s that for THQ. In the end 350 games industry personnel are now without work, 40 of which can be found in the UK. But companies have already contacted MCV expressing interest in speaking to these people. It’s a sad end to a publisher that has played a significant role in the development of the games industry over 24 years. But rather than these studios and IPs getting lost within big, global publishing giants like Activision or EA, they’ve largely found homes in smaller, mid-table firms, who will treasure their new acquisitions as their flagship products. “It’s obviously sad to see in such a process that so many jobs are lost, and many, very good people, after years of putting effort and dedication into a company, then suddenly they come to a hard stop. It is a sad moment for our industry,” concludes Kundratitz. Failed MMO's and proprietary hardware are suicide. Unless you have EA or Activision money to risk, just stick to doing what you do best. Here’s an odd story. Nordic games has purchased the THQ name and intends to publish games on the label. THQ went bust a couple of years ago and sold off the rights to many of its games, a few of which - including Darksiders - were snapped up by Nordic Games. But now they’ve gone a bit further. Speaking to Polygon, Nordic Games’ general manager Klemens Kruezer said that the company has bought the THQ name and will start publishing new games under it, possibly starting with MX vs ATV. “It was kind of surprise to some industry veterans and players that we were the winner of the auction of the THQ titles,” said Kruezer. “The challenging fact is nobody has ever heard about Nordic Games before [the THQ auction]. There were so many articles with the headlines ‘Who the f*ck is Nordic Games?’ We said, okay they were right. Kruezer said that further announcements would be made at Gamescom in Germany this August. More than 18 months after Nordic Games snapped up rights to THQ franchises Darksiders, Red Faction and more from the bankrupt publisher, Nordic announced today it has acquired the de Blob intellectual property from the company. 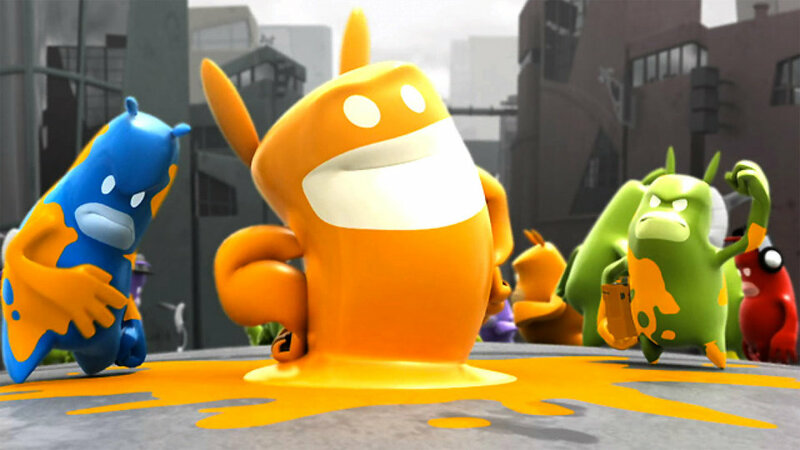 "de Blob is just a great and truly unique franchise," Reinhard Pollice, business and product development director at Nordic Games, said in a statement. "We are excited about what the future holds for this polychromatic extravaganza as the newest addition to our portfolio. We will evaluate opportunities with the existing games, as well as potential sequels." Nordic Games was one of a handful of companies that purchased intellectual property rights to THQ's games. Vienna-based Nordic spent $4.9 million for "substantially all" of THQ's IP, with the exception of Homeworld and Drawn to Life. Other companies that snatched up THQ's games, properties and developers include Gearbox Software, Sega, Ubisoft, Deep Silver and 505 Games. THQ published two de Blob games: de Blob for iOS, Wii and Windows Phone in 2008, and de Blob 2 for Nintendo DS, PlayStation 3, Xbox 360 and Wii in 2011. The colorful platformer-adventure games were chiefly developed by Melbourne, Australia-based Blue Tongue Entertainment, which shuttered in 2011.